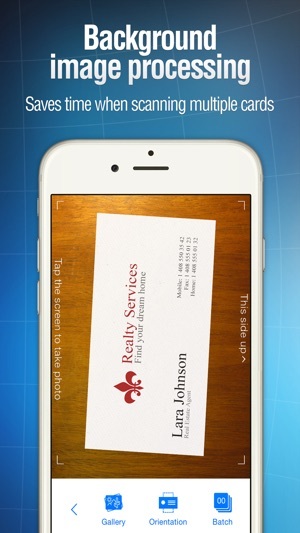 Instant recognition of business cards right on your iPhone. 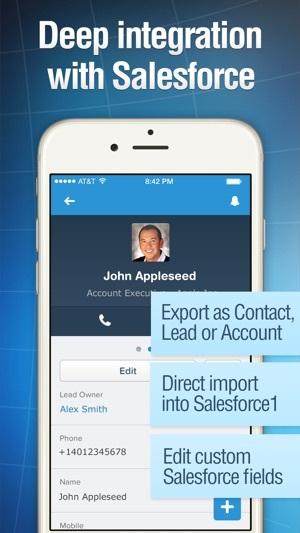 Import contact information from a business card directly to your iOS Contacts. Out-of-the-box integration with Salesforce and Evernote. Easy integration with other CRM systems. Featured in iPhone TV commercials. Business Card Reader is an excellent tool for business people, exhibitors at trade shows, expo attendees and sales staff — anyone who networks regularly! No need to manually enter contact information — Business Card Reader provides a time- and cost-efficient way to enter and organize important contacts. 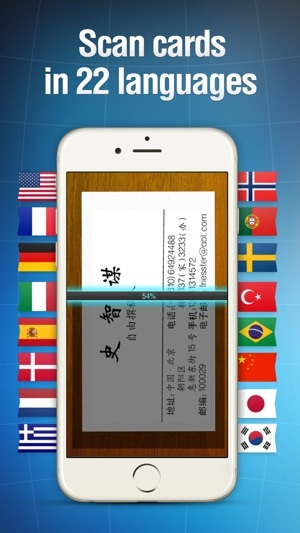 Business Card Reader recognizes business cards in English, French, German, Spanish, Czech, Italian, Danish, Dutch, Greek, Norwegian, Estonian, Indonesian, Finnish, Polish, Portuguese, Swedish, Turkish, Chinese, Japanese and Korean. 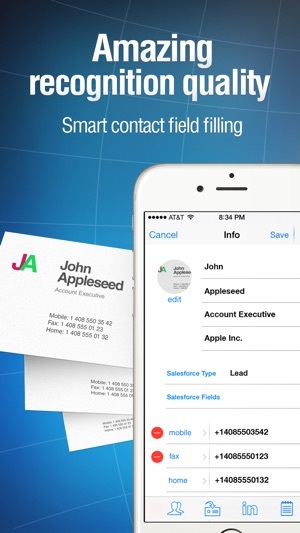 Business Card Reader takes a picture of a business card, 'reads' it using text recognition technology and automatically fills in appropriate contact information fields in iOS address book, which can be easily checked and edited. • Advanced Contact Search: by name, company, address, etc. BCR Cloud is offered as a yearly subscription for $16.99 per year. 1. Place the business card on a flat surface. 2. Good lighting is key: bright desk lamp or direct sunlight are necessary. 3. Hold the device right above the card. Keep the card aligned with BCR viewfinder edges and adjust iPhone/iPad positioning so that the card fits the screen size. 4. Tap the screen to take the picture. 5. After the recognition is done, you can check the results. 6. Tap Save to add the contact into your iOS address book. 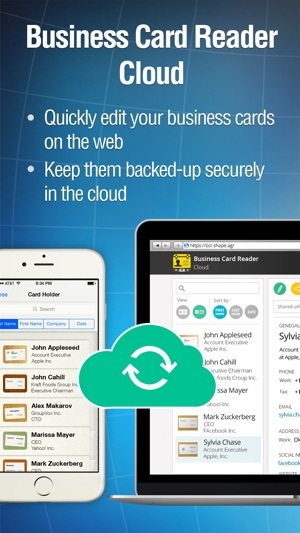 If you enjoy using Business Card Reader Pro, please leave a review. Thank you! 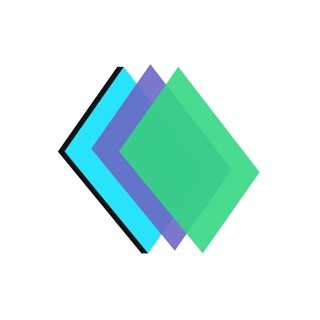 After reading fairly good reviews, I downloaded app and have been using often. It is VERY hit and miss. I often (1 out of every 3) get gibberish in all or most fields - and more often, I’m manually correcting at least one field. I can’t figure out why… Sometimes it’s over cellular, sometimes it’s when connected to Wi-Fi. And doesn’t seem tied To whether bus. card are white paperstock, traditional formats or more creative in layout. Other times it works like a charm. But if you’re looking to frequently and put cards as I am, having to manually enter 1 of every 3 is neither impressive nor useful. Great program. Now when anyone hands me their card rather than manually entering all their info into outlook I can use this program and its done for me. Highly recommend it. Four years later still think it's just wonderful!